The modern version of the well known old lure. 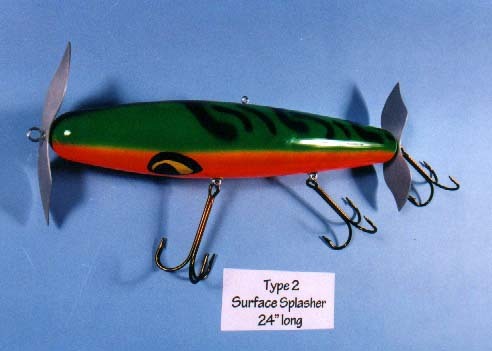 Used mainly for bass .It features aluminum propellers front and back and large black and yellow eyes below. I built the first version of this lure as a companion piece to an oil painting featuring this lure. Finish: Florescent green body with black markings on top and florescent orange belly. Large black and yellow eyes underneath.